The effects of the Earth’s warming climate continue to take their toll, globally, including in northern Spain. Tucked away in Spain’s northwest corner, hot, dry summer days are coming much earlier and persisting much longer in Galicia than has been the case over the course of the past century. 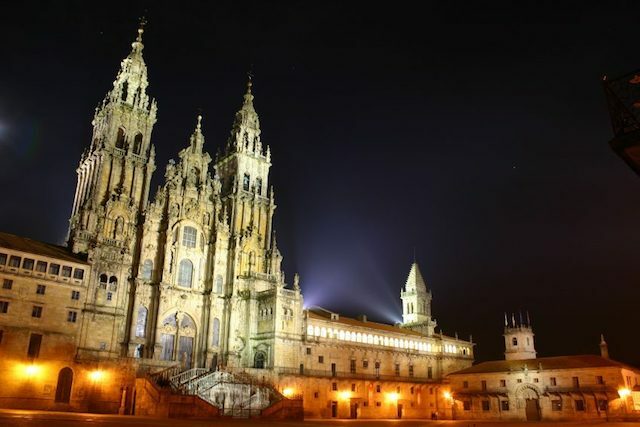 Rising temperatures and balmy days in mid-May signaled the onset of summer in the Galician city of Santiago de Compostela. In 1960, the season typically lasted 33 days. Fast forward to 2016 and persistent summer temperatures began in the second week of April, with the season lasting 60 days, according to climate scientists at the University of Santiago de Compostela (USC). 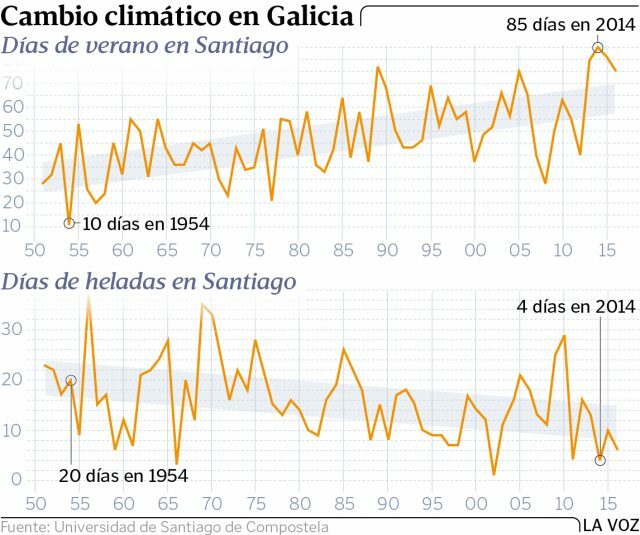 Furthermore, average temperatures have been rising steadily in Santiago during the past sixty years. Over the long term, residents and visitors are experiencing more and hotter summer days (temperatures higher than 25 Celsius (77F)) – 85 in 2014 as compared to 10 in 1954. In addition, they have been experiencing fewer cold days per year – 20 in 1954 as compared to just four in 2014, as well as steadily higher daily high and low temperatures, according to a La Voz de Galicia news report. Galicia’s lush green landscape and rugged coastline bear testament to the wet, moderate temperature climatic conditions that have come to define and characterize Galician daily life. The culture history of the region stretches back many thousands of years – to around the time of the end of the last Ice Age. As the Tower of Hercules attests, its colorful past includes the presence of Roman legions, architecture, and settlements. Galicians have relied on an abundance of natural resources – forests, fertile soils, plentiful rainfall, rivers and rich marine ecosystems – to sustain and enrich their lives. 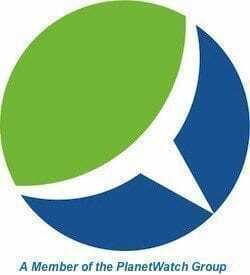 This continues to the present day, although somewhat diminished with the rise of an economy increasingly centered on services, global trade and investment, digital data, and IT communications technology. Nonetheless, the stark rise in temperature, longer, hotter summers and less precipitation is now felt across Galicia’s economy and society, as it is across Spain and worldwide. More wildfires are breaking out and damaging or destroying timber and farmland, as well as threatening homes, public and commercial facilities, and communities. Longer, hotter, drier summers are also taking a toll on agricultural production, timber yields, and increasingly precious freshwater resources. The effects are evident off the Galician coast, as well. Shifts in the number and types of marine species are being recorded as those that are mobile migrate in search of colder waters. On the other hand, researchers have observed an increase in warm water species in Galicia’s coastal waters. As always, residents are proving themselves adaptable. However, climate change and warming are now a common topic of conversation and media attention in Galicia and throughout Spain. This stands in stark contrast to many parts of the US, and more particularly on the part of national, and some state and local government leaders. More hot, sunny summer days bring people out to the beach more often and in greater numbers, which helps Galician cities, such as La Coruna, boast of having world-class, Blue Flag beaches. On the other hand, energy usage steps up a big notch, as people turn to air conditioning to stay cool. Warmer autumns also tend to result in less incidence of flu. Overall, the trend is considered beneficial to human health, USC professor Alberto Marti said in an interview with a La Voz de Galicia reporter. On the other hand, more summer heat waves lead to a bevy of ailments and illnesses, from mild discomfort, more allergic reactions and changes in behavior and attitude to respiratory problems, heat exhaustion, heat stroke and heart attacks. Marti is a member of a nationwide university research team named Geobiomet. Among the research they are carrying out is a project that aims to determine the effects the longer, hotter summers and shorter, warmer autumns are affecting residents’ health.